​​You must pass both theory test parts to pass the test. ​We give you a pass guarantee! When can I take Theory Test? The theory test is made up of two parts; the multiple-choice part and thehazard perception part, both of which are taken in the same sitting for car and motorcycle tests. If you pass one part and fail the other, you will fail the whole driving theory test and you will need to take both parts again. Once you have passed the theory test you can then apply to take your practical driving test (car, motorcycle, lorry or bus practical test). The questions in each multiple choice test vary according to the category of vehicle you're hoping to obtain a licence for, i.e. a motorcycle theory test will contain specific questions that don't appear in any other test. A question and several answer options will appear on screen and you have to select the correct answer to the question by touching the screen. The theory test involves 50 questions divided into 12 topics. These topics include driver attitude, road traffic signs, the effects of alcohol whilst driving, drugs and fatigue, eco and environmental aspects of vehicles. This forms a second section of the theory test and must be passed at the same time (cars and motorcycles). This section is designed to test your awareness of potential hazards whilst driving in in different weather conditions. Some video clips also show driving at night and in low-light conditions, like dawn and dusk. You will be presented with a series of 14 video clips each about one minute long, which feature every day road scenes. In each clip there will be at least one developing hazard, but one of the clips will feature two developing hazards. 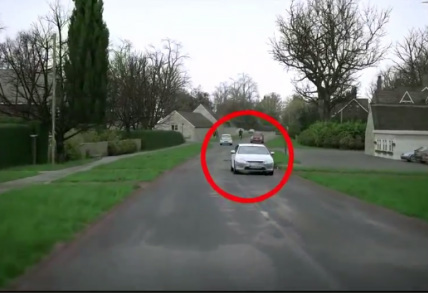 The videos feature various types of hazard, such as road conditions, vehicles, bicycles, and pedestrians. Unlike the multiple-choice questions, for the hazard perception test there are no separate versions for different vehicles, e.g. car, motorcycle, heavy vehicle etc, each vehicle category takes the same test - however, the number of video clips in the test, and the pass mark is different for each category of tests. You will not be able to review your answers to the hazard perception test; same as on the road, you will only have one chance to respond to the developing hazard. How the scoring mechanism of the hazard perception test works? There are over 160 theory test centres throughout England, Scotland, wales and Northern Ireland. Theory tests are conducted between 9:00 am and 5:00 PM Monday to Friday. Certain theory test centres operate on Saturdays. Find theory test centre here. You need to pass both the multiple-choice and hazard perception parts to pass the theory test. You’ll then get a theory test pass certificate. You’ll need the certificate number when you book your practical test. A theory test certificate lasts for 2 years from the day you passed. If you failed the theory test, you are entitled to reapply the next day. ​You will however have to wait 3 working days before you are able to re-sit the theory test. get free instant online access up to 140 DVSA revision questions. Login and you will get full access to Theory Test revision and Hazard perception online. All learner drivers need to pass the theory test before they can book a practical driving test. 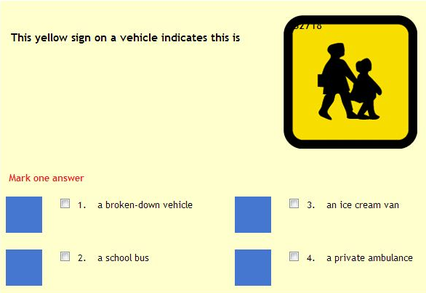 try traffic signs test with more than 200 traffic signs. Here you will find complete resources and tools to study, practice online or on your mobile devices, track your progress, receive guidance and tips on passing the UK driving theory test. 1DRIVER.co.uk test content is fully licensed from the Driving and Vehicle Standards Agency (DVSA) - the people who set the tests.